Here's a quick 'before and after' look at the logo makeover of one of our clients, Fusion Teas. The old logo had served Fusion well for years, sure, but it also violated several of the major best practices for a good logo (e.g., scalability and looking good in black-and-white). 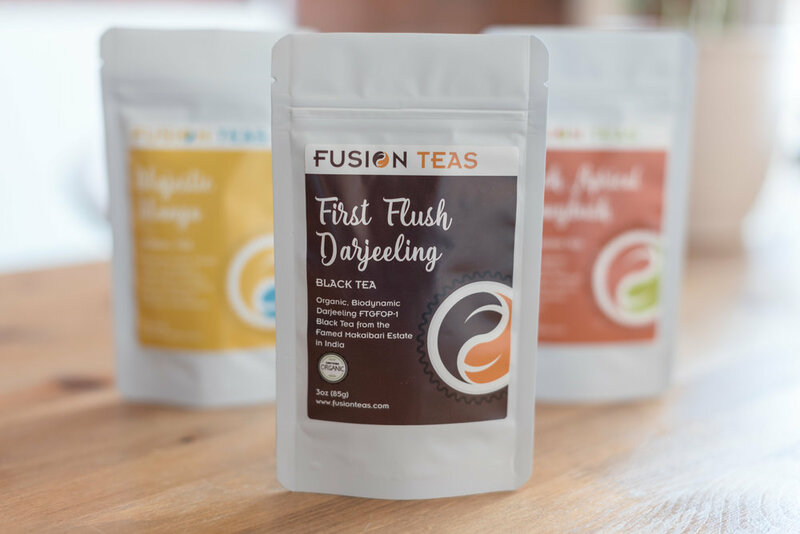 Worse yet for the logo (and better for the company) Fusion had evolved far beyond its old logo and the aesthetic of a 'just getting started' tea business. It had grown significantly over the years, and it was time for their logo to do the same in order for the look to match the brand now and in the coming years as they continue to expand. "It didn't convey who we are and what kind of tea company we run. While I did like the two leaves, the yoga-Zen master did not represent us. We are anything but Zen, lol! 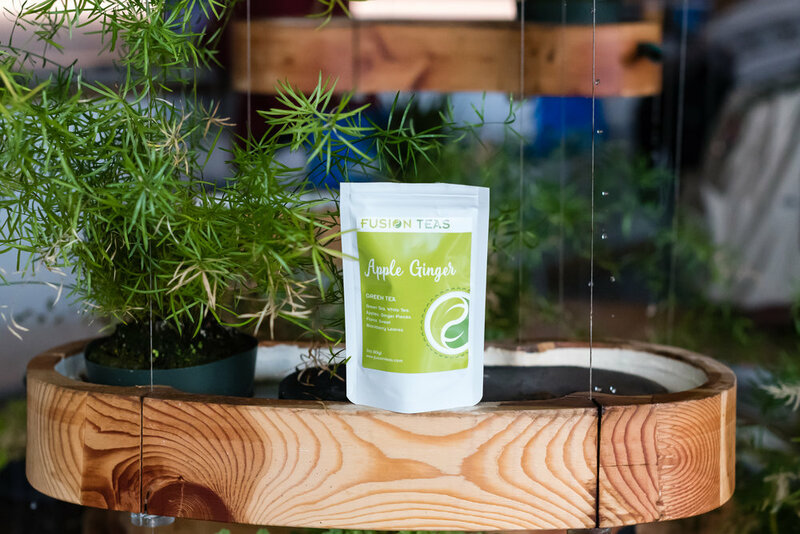 We're a modern-day tea company in the US." Clean, clear, distinctive. Scalable. Works well in black-and-white as well as in multiple color schemes. In short... simply better for a growing tea business! "We love the new logo. It's exactly what we envisioned. The new logo reflects our name 'Fusion' a lot better. The definition of Fusion is, 'The process of combining two or more things together to form a single entity.' The two leaves that are designed into the Yin and Yang also help represent that." Here's how I know Thomas really loved the logo. He sent me a onesie with the logo for my little one. Sweet! Oooh. Gorgeous! (If we do say so ourselves, that is...) And what followed was even better. With a new photoshoot of the package design (courtesy of our Social Media Maven), we posted images across multiple social media profiles, resulting in more likes, shares and social-motivated purchases than the previous package design. "We are super happy with our new packaging. In our view, the packaging is almost as important than the tea itself. When our customers love to look at the label and packaging these good feelings can spill over and influence how much they like the tea. Customer feedback has been very positive and they seem to really like the direction we took. It's also cleaner and more professional." YES, love to see our clients' clients happy, too! "Re-branding can have a huge impact on a business. It's human nature to go through ups and downs and get stuck in a rut or too comfortable. Re-branding can light the fire again and get you really excited about your brand!" Ready for your own 'after' pics? Check out our design services and schedule a discovery session call to talk with me about your brand's evolution. I look forward to talking with you soon! Note how the lines surrounding the circle motif vary from tea category to tea category. Scroll back and looks at the 'before' pick again. See the difference! The Tea Mavens are your go-to tea pros. We know how to increase your ROI, get your more customers. improve your web traffic & more. Contact us today for a free consult call. 5. You have a tea project you'd like us to take on and it isn't listed in our offerings. 4. You'd like to schedule a free, 45-minute discovery call with us. 3. You just purchased a package and are ready to schedule an appointment with us. 1. You're ready to take control of your tea business and your life!